Much to my surprise, the case I made for my Kindle using tiny granny squares inspired a beginner to crochet a case of her own. When she posted it on Facebook, a friend of hers mentioned she’d made a case for her Nook and it got me wondering just how many people are making cases for their eReaders and other tech toys. A quick web search assured me that lots of people are doing this. I’m not the only one who’d rather have a handmade case than one from the store. There are lots of options for the lover of knitted and crocheted cases. You can shop on Etsy if you don’t feel like you have the time or skill to create your own. If you prefer to make things yourself, you can improvise like my friends did, or there are plenty of free patterns on-line if you don’t feel up to making a case from scratch. Here are the fun crocheted cases made by Kristen Lamb and Kayla Jayne. Kristen is just learning how to crochet and says it was seeing my case that inspired her to make her own. 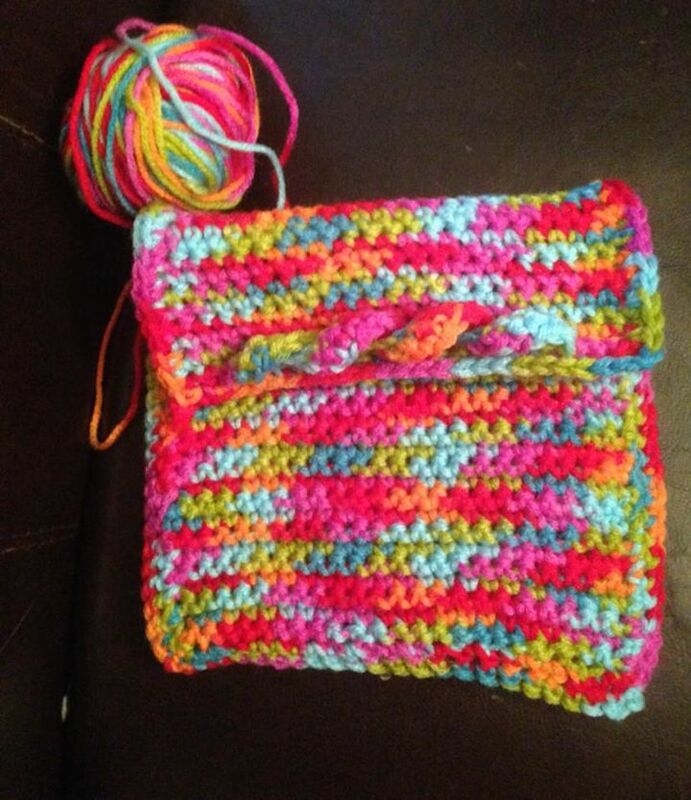 While her design is simple, the multi-colored yarn gives it pizzazz. Kristen Lamb’s Kindle cover. I love the candy-colored yarn and the curly doodad on the flap. 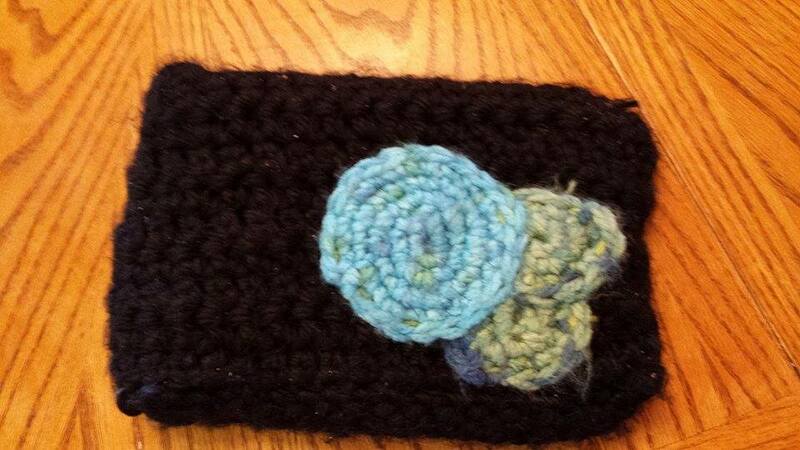 Kayla Jayne said her cover was a fun way to use up some leftover yarn. She even made the button. Kayla Jayne’s Nook Cover, front. Notice the cool bobble button. Kayla Jayne’s Nook Cover, back. I love that she added decorations. Another example of a simple case that an experienced knitter could easily make is this ribbed version by recipesatrandom. Sometimes projects are easier to handle if you have a pattern. 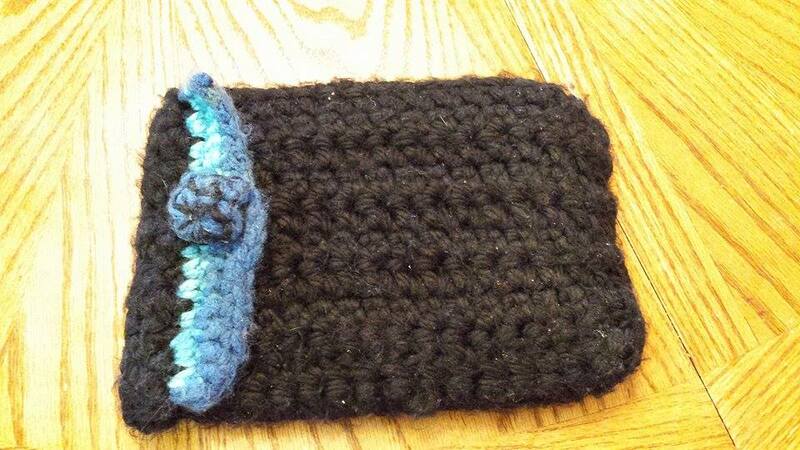 aknitica has a tutorial on how to make her pretty knitted Kindle cover. If you’d rather crochet, you can make this fun striped cover by Hesta Villiers with leftover bits of yarn. Perhaps the most versatile pattern I found is the Ultimate Universal Electronics Cozy, which shows you how to make a case for any electronic device you want using a simple trick to ensure a custom fit. There are plenty of other designs and ideas out there. I even found someone who is making lovely album covers using granny squares, which could be adapted to just about any kind of case or cover. All these great designs have me looking around the house to see what else needs a handmade cover. I hope they inspired you, too! Do you make covers, cases, or bags for your electronic gadgets? If so, please share a picture in the comments. I’d love to see them. These are GORGEOUS! Thanks for featuring my noob project in the pics! And yes, you inspired me. I don’t believe I would have thought to do this if you hadn’t posted the one you made. And here I have been griping about the boring expensive cases for sale, LOL. Thank you for letting me include your case. I want readers to know there’s a whole gamut of options out there, and that beginners can make great stuff, too, as long as they are willing to try. We all deserve to be surrounded by beauty and love, and I think surrounding ourselves with handmade objects is one of the ways to achieve this. Handmade is what makes it both beautiful and full of love.